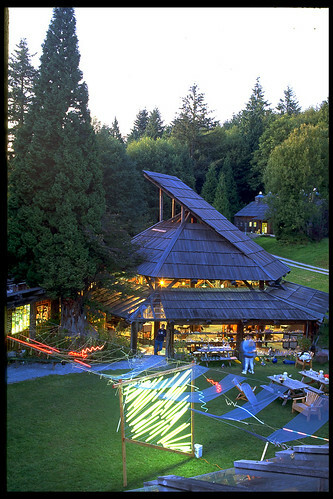 Installed on the school grounds, the fluorescent wall was photographed for the cover of a book on Pilchuck’s history. The little glass cabin was made by one of the school’s founders. One summer I created an installation in the now abandoned site, using neon, slide projections, black lights, drilled holes and saw dust. These storefronts were converted into lightboxes by using transparencies, large scale graphics painted on frosted mylar and flourescent light fixtures. 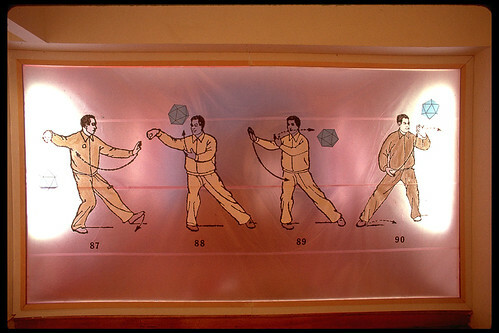 Rolls of pink cellophane were used in these installations as well. 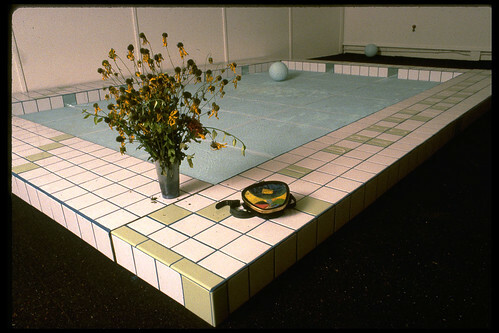 This installation of photographic images was projected into a mixed media sculpture of a swimming pool. The pool was constructed in wood, tile, blue grout. On the green tiles across the front, the letters of the title are glazed in white, and the grout is a teal blue. I Dream of You as I Swim wasinstalled at Cincinnati Artists Group Effort, aka C.A.G.E. 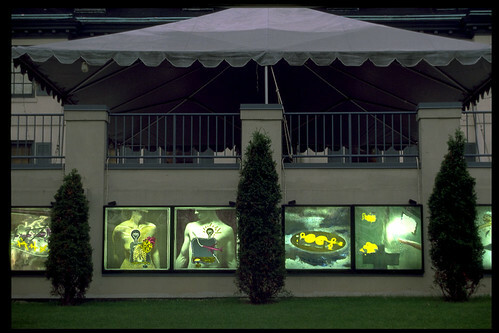 Across the front of Pittsburgh Center for the Arts, Mellon Park, in Pittsburgh, PA, a series of twelve lightboxes covered in the building’s windows. Original collages are included in the slideshow which are digital files, not photographs. Once they were printed in black and white on mylar, these images were sandwiched with plexi glass, paint, color gels and illuminated from behind.